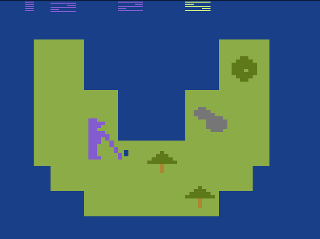 I would never suggest that it would be easy to create a golf game on the Atari 2600, but the system is definitely capable of a better offering than this. Golf isn’t a horrible game, but it could have been a lot better. The developer did an admirable job of trying to re-create the feeling of playing golf. Each hole has a different layout, there are trees and sand traps blocking your way, and putting has a separate screen that zooms in on the green. The game also displays your total score, your score on the current hole, and the par for the current hole. For a VCS game, the holes don’t look that bad but they have the same blocky unimaginative graphics common to all first-party Atari games. The golfer looks like the Jolly Green Giant or Paul Bunyan standing taller than the trees holding his pixelated club. With practice however, Golf gets better. The real question is whether or not it’s worth the time it takes to develop a proficiency with the game. It’s a shame that Activision never tried making a golf game for the 2600. Unfortunately, this is the only golf title on the system, which is mind boggling considering how many games were released for the VCS, so there isn’t any choice in the matter. This game is better than nothing, but just barely. Tagged 2600, Atari, Golf, Review, Sports, VCS. Bookmark the permalink.